From Kindergarteners’ dreams inspired by Dr. Martin Luther King, Jr.’s famous speech to rhombicuboctahedrons made by fifth-graders, students in AC’s Lower School demonstrated some of their recent work in a Celebration of Learning assembly. After reciting the “I Have a Dream” Poem in honor of Dr. Martin Luther King, Jr. Day, each Kindergarten student read a dream for the future. Each Kindergarten student read a dream for the future. Above, they include: for poor people to have water, to love everyone, for homeless people to have houses, to give people food, and to keep the world clean. First-graders recalled facts they learned about local animals, with masks they had made with Ms. Alexander. They also performed a rap song they wrote with Mrs. Grossman about recycling. “Bee Kind” was the second-graders’ motto and recent project, with its bee mascot Zinger, whose voice made everyone giggle. They presented different ways people could add kindness in their daily lives. Third-graders performed a skit to demonstrate multiplication strategies they’ve learned, including skip counting by threes, the sevens distributive property, halving the fives, and using solvemojis to “crack the code” of symbols representing numbers in multiple operations. AC fourth-graders presented part two of their Zero Hunger project, explaining how wasting food also wastes money, labor, fuel, water, and time, and giving tips on how to reduce food waste. Fifth-graders watched the documentary, “The Number on Great-Grandpa’s Arm”, which inspired the students to write letters to the film’s creators. After reciting the “I Have a Dream” Poem in honor of Dr. Martin Luther King, Jr. Day, each Kindergarten student read a dream they have for the future. These kind-hearted children included dreams for everyone to have a house and car, food, water, give to others, take care of children, keep the world clean, help other people, and for everyone to be loved. Save the Earth, Recycling Wins! where all the trash should go. Where to put it? The compost! If you recycle, you protect our lands. Put them all in the big blue bin! Do this now, and you will win! Listen up, girls and boys! it makes our earth a stinky place. Just as fun as playing! Saving our earth is thrilling! “Bee Kind” was the second-graders’ motto and recent project, with its bee mascot, Zinger, whose voice made everyone giggle. They presented different ways people could add kindness in their daily lives. They also performed a regal “Kings and Queens” folk dance. What strategies can be used to multiply numbers? Third-graders performed a skit to demonstrate multiplication strategies they’ve learned, including skip counting by threes, the sevens distributive property, halving the fives, and using solvemojis to “crack the code” of symbols representing numbers in multiple operations, and having an “ice cream party” treasure hunt after solving their 1,000th math problem of the year. Plan ahead to buy food you will actually use! Use up leftovers. Make a soup or an omelette. Just use them up! Clean out your pantry. Use up food close to expiration or donate. Preserve, pickle, or can food! As an Allendale Columbia school student, I pledge to do the following. I pledge to be mindful about food during lunch. I pledge to ask about portions when getting more food. I pledge to waste as little food as possible by taking only what I will eat from the salad bar. I pledge to try and drink all of my milk, juice, or water each day. I pledge to be appreciative of the hard work our lunch staff does on a daily basis. I pledge to be courteous when informing others about the importance of curbing food waste. If I am out to eat and there are leftovers, I will bring it home in a box. How many books have you read since September? Fifth-graders updated everyone on their 40 Book Challenge, where each student is challenged to read 40 books from a variety of genres. They’ve read a total of 239 books this school year, and since their last Celebration of Learning in November, they’ve read 102 books. They explained how to make polyhedrons (many-sided objects), starting with “nets,” which are flat shapes that can be folded into 3-D objects; rhombicuboctahedrons, objects made by folding paper into 6 triangles and 18 squares; and stellated (star-shaped) rhombicuboctahedrons with 18 folded pyramids. They also watched the documentary, “The Number on Great-Grandpa’s Arm,” which inspired the students to write letters to the film’s creators. There’s a whole lot of learning going on in Lower School! After working at a small college in California and some early tech companies, John spent a stimulating 10 years at Microsoft through the 90s as a systems engineer and managing executive relations programs. 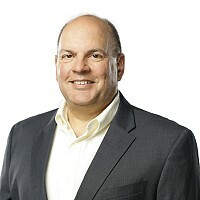 Since then, John has worked with non-profit organizations and has held leadership roles in independent schools in New Jersey and Connecticut in development, communications, and technology. He earned a Bachelor of Arts in Natural Sciences (Biology) from Colgate University.